Numerous lawsuits were filed this week against Apple, as a number of consumers hope to take the company to task over reception issues that arise with the new iPhone 4 when the left side of the device is covered with a hand. At least three class-action complaints were filed in California, Maryland, and Texas. The largest was filed in a U.S. District Court in Oakland, Calif., and has a list of 11 plaintiffs included in the complaint, residing in California and New Jersey. The other two each include one plaintiff. Apple has been accused of violation of the Federal Communications Act, three counts of products liability related to negligence, defect in design and breach of implied warranty, intentional and negligent misrepresentation, fraud by concealment, unfair business practices and more. "The iPhone 4 manifests design and manufacturing defects that were known to Defendants before it was released which were not disclosed to consumers, namely, a connection problem caused by the iPhone 4's antenna configuration that makes it difficult or impossible to maintain a connection to AT&T's network," the California complaint reads. "Defendants have failed to provide customer support to assist iPhone 4 customers regarding this defect. Consumers are left with three options: hold their phones in an awkward or unnatural manner, return their phones and pay 10% 'restocking fee,' or purchase Apple's own 'bumper' cases for their phones, costing $29.99 in addition to the premium they have already paid for the phones themselves, which may somewhat ameliorate the iPhone 4's defects." The complaints also target AT&T, the exclusive wireless carrier of the iPhone in the U.S. They allege that the company helped to design, manufacture and market the new iPhone 4. The California suit also references e-mails allegedly sent by Apple Chief Executive Steve Jobs, in which he reportedly told one customer that they were holding their iPhone 4 "the wrong way." 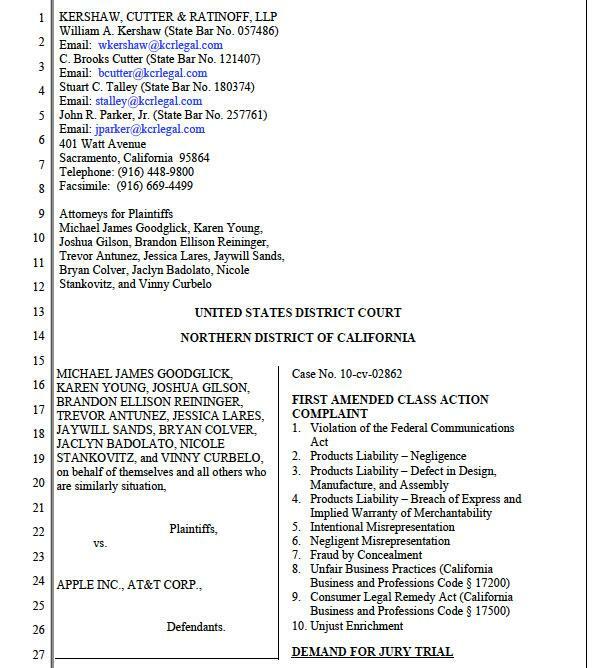 The class action suit filed in Oakland seeks damages, and also asks the court to issue an injunction on Apple and AT&T, forcing them to "undertake an informational campaign" to let the general public know the "wrongfulness" of the companies' practices. It was filed on Wednesday, June 30. The first sign of a potential lawsuit arise on Tuesday, when a California law firm asked people, via their website, to share their experiences with reception on the iPhone 4. Wednesday's California lawsuit was filed by that same law firm: Kershaw, Cutter & Ratinoff LLP. After the iPhone 4 was released last week, Reports began to grow that Apple's latest handset can lose reception when gripped wit the left hand. On some devices, covering or even just touching the point on the metal perimeter antennas meet on the bottom left corner of the phone can cause loss of signal and even dropped calls. When the iPhone 4 was announced earlier this month, Apple revealed that the metal band around the outside of the device has breaks in it to allow the multiple antennas inside the device —for cellular service, Wi-Fi, Bluetooth and more —to establish connections. The larger metal piece on the right side of the phone serves as the GSM/UMTS cellular antenna, and the smaller portion on the left side is responsible for Bluetooth, Wi-Fi and GPS. Apple publicly responded to reports of reception issues, stating that any mobile phone has reception issues when held improperly. The company suggested that customers avoid gripping the handset in the lower left corner, or use "one of many available cases" to prevent one's skin from touching the metal band.